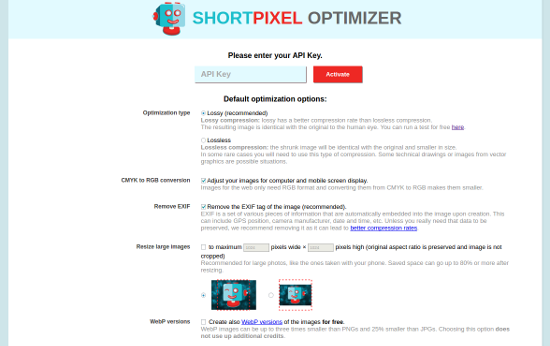 ShortPixel Website Optimizer offers a straightforward web interface to our API, available to any PHP website (Magento, Joomla, Drupal, custom brew, etc.) and allows optimization of the site's image and PDF folders. While you optimize a folder, you can watch the optimization progress in the browser. 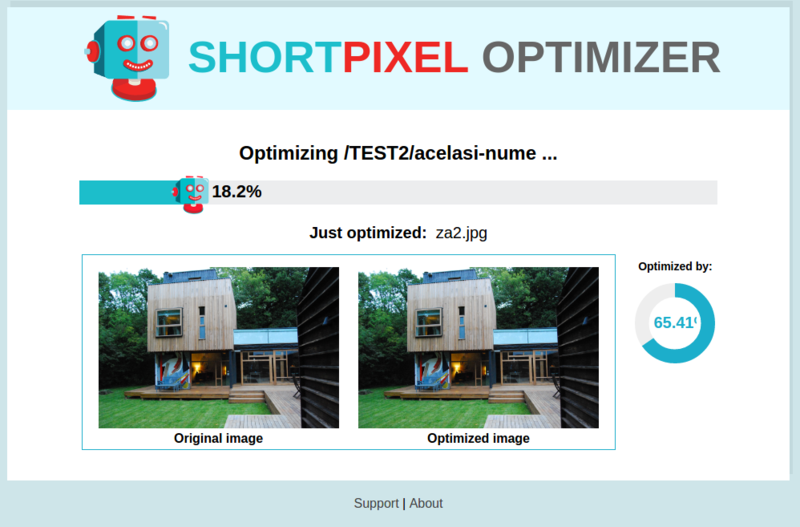 Step 1: Download the latest stable release: ShortPixel Website Optimizer v. 1.3.2 - lib.1.5.3 ( release notes ) and unpack it in your website's root folder. You should find a shortpixel-web subfolder that was extracted from the archive. Step 3: Open in browser the ShortPixel Website Optimizer startup page at http://[[your.website.domain]]/shortpixel-web/webroot/index.php. If the page loads properly, you're up and running. If the page does not load, it usually means that there are rewrites in the server configuration files that redirect all URLs to a master script. Depending on your webserver, you might need to make specific changes in the webserver configuration. Step 1: Review the default settings and input the API Key to activate ShortPixel Website Optimizer. The settings will be saved in a file shortpixel.ini in the shortpixel-web folder. Step 2: Select the folder that you want to optimize and press Optimize Now. If you change the defaut settings, the changed settings will apply only to the selected folder. You are also prompted for a corresponding URL for the folder - ShortPixel Website Optimizer tries to figure it out itself but you can change it if it's not correct. Using a corresponding URL will significantly speed up the optimization as the images are sent as URLs and our optimization servers can download them asyncronously instead of waiting for one big POST attachment to be uploaded. You can also press ignore if the folder is not accessible via Internet. 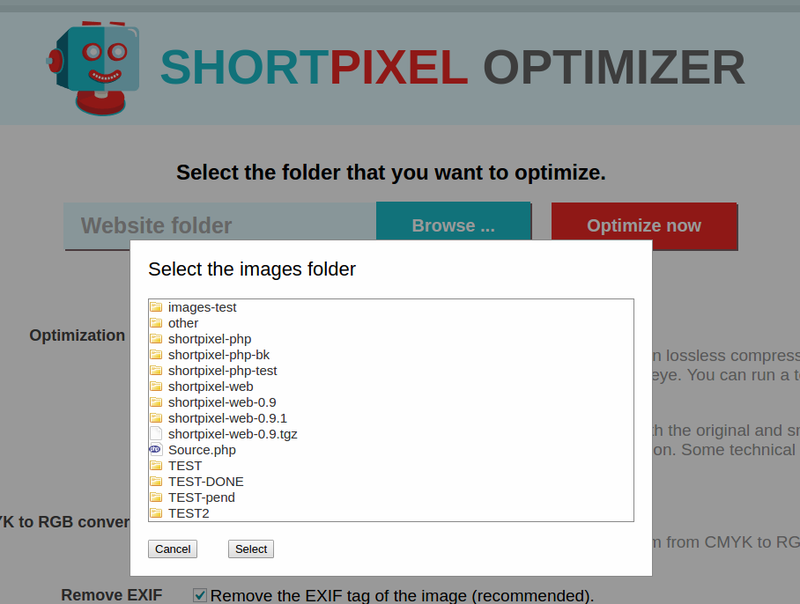 Step 3: Sit back and relax while ShortPixel Website Optimizer optimizes the files for you. Please remember to keep the browser open in order for the optimization to proceed. If for any reason you close the window or the Internet connection is temporarily down, just select the folder again after reloading the page, and the optimization will continue from the point it left. Any parameter that you would normally pass to cmdShortpixelOptimize will work as a GET parameter in the URL. The web user needs to have rights to execute an at job. More info. ShortPixel Website Optimizer sends each image to our optimization servers and retrieves the optimized version, replacing the original. You need an internet connection in order to be able to optimize images with our service. ShortPixel Website Optimizer creates for each folder that is selected for optimization a .sp-options file containing the selected options for that folder. Also, in each folder and subfolder, a .shortpixel file is created, containing the optimization status for each file and subfolder in that particular folder, alongside with information such as the file size, percent improvement and optimization date. Fix sending a request with the file count of the folder, instead of folder name, in some circumstances. Fix the backup folder with prepended / when choosing the same as the source folder. [LIB] Add a static function for getting the list of files ignored when listing a directory. [LIB] Fix broken symlink for the examples file. [LIB] Smart lock with variable timeout. [LIB] Cache the folder scans for a given time if the parameter cacheTime is set, in order to improve speed. [LIB] Fix CLI retrying when folder is optimized but there are some pending files which are actually corrupted files. [LIB] Fix retrying when the source is not the same as the destination folder. Integrate the Website Optimizer with the CLI so a job running on cron using CLI can be monitored from the Website Optimizer page. Total optimization percent displayed in the optimization success page.